This week we released version 0.23.0, which came with some big gameplay changes, including a new unit: the Militia. 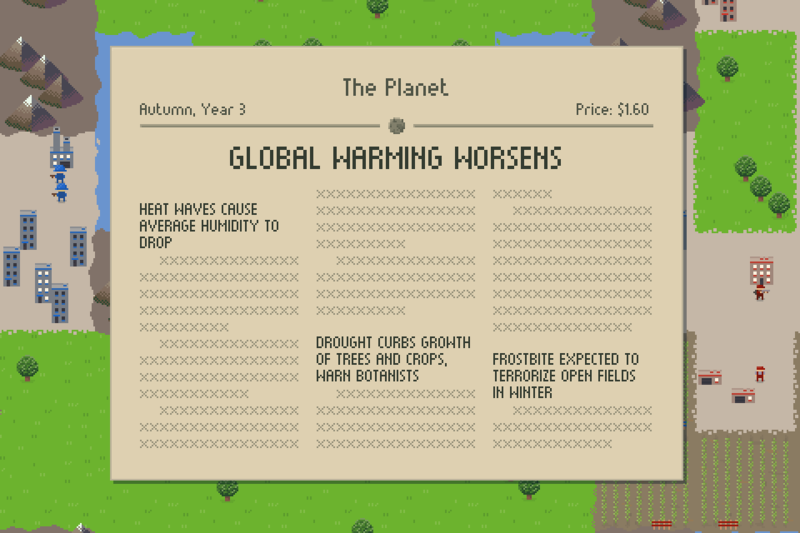 In this devlog we want to highlight some of the recent changes and our rationale behind them. If you haven't already, you can try out these changes by downloading the latest version either from our main page or via the itch desktop app. In order to keep things exciting, it is important for both players to have a fair chance of winning throughout the match. We found that having one of your City tiles captured by an enemy Rifleman unit was a little bit too crippling. Not only has your opponent achieved 50% of their goal (to capture or destroy both of your City tiles), you also lose a source of income and a means of producing Rifleman units. Conversely your opponent gains extra income and production, and the natural protection that the City provides helps them keep all of these bonuses while you struggle to reclaim your City. In order to alleviate this, we changed the win condition from capturing your opponent's City tiles to simply occupying both City tiles at the same time. Although easier to achieve, having one of your City tiles occupied is slightly less damning than having one captured, because you only need to get rid of the occupying unit in order to get your City tile fully operational again. To make early rushes a little bit weaker, the Rifleman units that you start with have been replaced with a new Militia unit. The Militia unit is similar to the Rifleman unit, but they cannot capture tiles and each little figure only has 1 hitpoint. This means large Militia units are still very good at attacking, but suffer considerably more losses when attacked in retaliation attacks or attacks of opportunity. 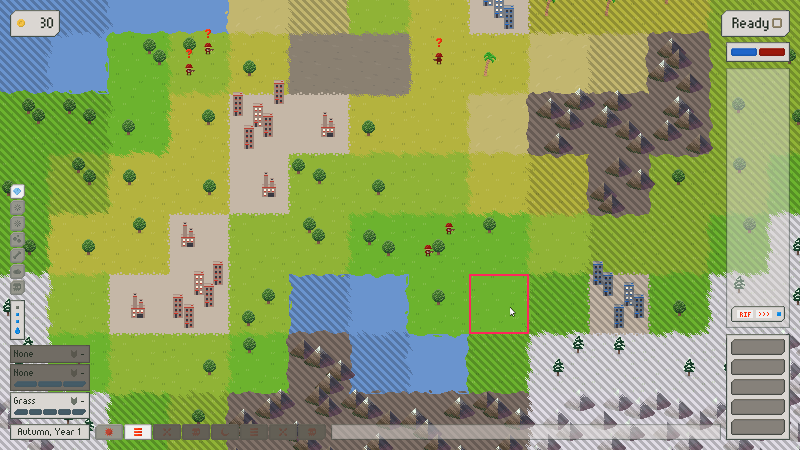 The reduced hitpoints also makes Militia units that are occupying your City tiles a little easier to remove. Militia units can also have up to 5 figures. They take the place of Rifleman units and can be produced at City tiles or Farm tiles; the Rifleman unit has been moved to the Barracks and its cost has been halved. Rifleman units can still capture tiles as usual, so they are now a more tactical unit to be used in conjunction with Gunner or Sapper units. We also made some changes to make defending more viable. As stated above, one of the things players had troubles with was prevent enemy units from slipping past their defenses. One of the reasons for this was that if you kept a unit on one of your own tiles, the production of units on that tile would be blocked. When producing a unit at a tile, you can now select where you want the unit to go after it is produced; it can stay on the tile, or move to an adjacent tile. This change allows you to keep a defensive unit inside a City tile to protect it, while still being able to produce units at that tile. Another change concerns the interaction between the Trenches tile and bypass attacks. A bypass attack happens when an attacking unit moves past another friendly unit to attack and then moves back afterwards. If the target of a bypass attack survives, it fires back at the attacking unit, but the bypassed unit can also take some hits. Trenches are usually used to protect your Gunner or Sapper units, but when an entrenched unit was part of a bypass attack, the Trenches used to offer no protection, leaving the entrenched unit very vulnerable. Since version 0.22.0, entrenched units no longer take part in these bypass attacks, leaving the attacking unit to fend for itself. We have also streamlined the in-game UI a bit, because we felt it had become too large. Although we want players to have access to all the information they need, too much information can detract from the overall understanding of the game. Therefore we looked at what information is really useful during gameplay and what could be better displayed in a different way. For instance, we removed the "chaometer" that gave a very rough estimation of how far global warming was advancing, and replaced it with newspaper announcements that appear every time global warming reaches a next stage. As a bonus, the newspaper's headlines warn about the new hazards to expect, which means we don't have to front load all of that information in the tutorial or a UI element. We are currently running our first Epicinium tournament over on our Discord server. As we release new versions between rounds, the players are continuously helping us improve the balance of our game, both by giving feedback and simply by playing the game in a more competitive setting. One of the design issues we will be trying to tackle next is making sure rush tactics have enough downside to give the defending player a chance to come back after thwarting the first wave of attacks. Expect more on that in the coming weeks!